The collapsed building in Kware in Nairobi where two people died. One person was yet to be accounted for on Wednesday evening as a mother and her six-year-old son died following the collapse of a residential building in Kware, Embakasi, Nairobi, on Monday night. 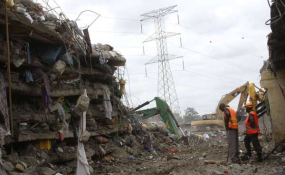 The body of the child was found by rescuers under the rubble Tuesday evening while the mother died at the Kenyatta National Hospital soon after she was rescued on Tuesday evening. Her other two children were recovering in hospital on Wednesday. On the second day of the rescue operation on Wednesday, only 25 per cent of the work was done after it was reported that there was a missing person who went back to his house before the seven-storey building came down. According to Mr Pius Masai, the deputy director, National Disaster Management Unit, the man who is yet to be found, had rushed back to the house, apparently, to switch off the lights when the building collapsed. "We have a new case from the police that the man was on his way out before he rushed back to switch off the lights, when the house collapsed," said Mr Masai. On Tuesday evening, police managed to retrieve three people alive -- a woman and two children -- and one dead child. The woman died while receiving treatment at the Kenyatta National Hospital. "One body of a male child was retrieved from the debris last (Tuesday) night. Fortunately, a total of three persons; a female adult, a female child and a male child were rescued alive from debris but the woman succumbed while undergoing treatment," said Mr Masai. He added that the search for seven people who were reported missing by their families at the beginning of the operation had been closed since they have all been found. A chicken was also rescued alive as money and other important documents were recovered at the site as rescue operations continued. Mr Masai said that limited space around the area was slowing the job since the house is surrounded by a smaller building and another seven-storey building which is tilted and risks falling. Tenants in adjacent houses have also been issued with seven-day eviction notices as per the law, after which the buildings will be brought down. Mr Masai said opportunists have been taking advantage of the disaster and giving false information to the rescuers. "Someone came from Murang'a, saying that someone was calling from what was the seventh floor and the Kenya Defence Force rescue team risked their lives searching for the person but later found out it was a lie," said Mr Masai. He added that thieves and criminals have been a major challenge in the operation, as on Wednesday they attacked National Youth Service officers who were helping in the rescue. Embakasi East sub-county administrator Charles Mutinda said the owner of the doomed building has been found but is hospitalised. He said that he has agreed to present himself to the county officers once discharged to answer queries regarding the building. A woman who had claimed to have lost her two children on Wednesday found them alive. The children has escaped from the building on their own. Ms Dorothy Aoko has, however, refused to leave the site, saying she wants to find her household items from the debris. Ms Aoko said it will be difficult to start life afresh but is grateful that her family is well.